2013-14 Panini Prizm Basketball is shining bright once again. Literally. Led by a growing assortment of Prizm parallels, the brand's sophomore hoops set is once again capturing an under-served part of the sport's collectors. While not the cheapest set on the market, Prizm offers a more of a pack-opening and set-building experience than a lot of Panini's other sets in a similar price range. There are autographs, some of which are drawing strong attention, but the main focus is on color. Leading the way are Gold Prizms. Numbered to 10, some of the first cards listed saw huge sales. And it's not just the rookies. The first LeBron James sold for $800. A second base Gold and a Gold Prizm Brilliance LeBron James also topped $600. Other early Gold sales around the $500 mark or higher include Kobe Bryant, a Kevin Durant Brilliance and a Michael Carter-Williams. A Gold Autograph of the rookie also eclipsed the $500 mark. 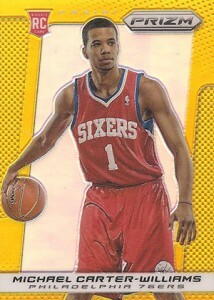 2013-14 Panini Prizm Basketball has no shortage of other Prizms to chase. Besides Gold, there are ten other colors. Other low-numbered versions likely to draw attention include Orange (#/60), Purple Die-Cut (#/49), Black (1/1) and Black Mosaic (1/1). Below is a real-time look at the 50 most-watched 2013-14 Panini Prizm Basketball card auctions currently listed on eBay. It updates automatically as new items pop up. 2013/14 Panini Prizm Giannis Antetokounmpo Rookie #290 RC! Giannis Antetokounmpo 2013-14 Panini Prizm RC Rookie Bucks #290 Mint Condition! KOBE BRYANT 13-14 Panini Crusade PURPLE PRIZM PARALLEL #08/49 HIS OLD JERSEY # !